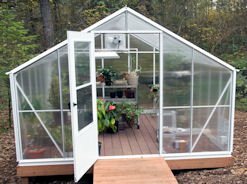 So, you have decided to build a greenhouse, but you are confused about which type of greenhouse covering would be best for you. Let’s take a look at some of the pluses and negatives of polycarbonate sheets and polyfilm coverings. We will discuss R value, installation, cost and lifetime expectancy. R value is defined as a materials ability to resist heat flow. The higher the R value, the less energy it will take to heat the same size space under equivalent conditions. This may or may not be a concern to you depending on how you are going to use a greenhouse. The most common single film used for greenhouses is clear 6 mil, 4 year covering. What this means is that the film is 6 mil thick and that the UV protection is warranted for up to 4 years. There are also some other types of film such as overwinter (this film is meant to last one year), white films (lower light transmission) , and reinforced polyfilm (with a rip stop cord). The R value of single polyfilm is 0.87. It is the least efficient of all of the greenhouse coverings we will discuss. Installation can be done in several different ways. If you have a wood frame you can use batten tape and staple through the cover and the tape into your frame. If you have a wood frame or a metal frame you can use the base and wire system. The base is screwed to your frame and the cover is secured using a W or wiggle wire. This is a pretty simple installation, but you want to make sure that you do not try to do this on a windy day. You will need several people to do this depending on the size of the greenhouse. The single polyfilm will be the least expensive of all of the coverings we will discuss. This film should last you the 4 years that the UV covering is guaranteed for. The only issue with this covering is that you may get a tear. There is repair tape available for this. But, if you are not there and not able to fix a tear in a timely manner you may lose the entire cover. This is why some people will choose to go with the reinforced polyfilm over the clear 6 mil, 4 year. It has a rip stop cord that will keep a tear from spreading. That way you will be able to fix the tear no matter how soon you are able to get to it. You can do a double polyfilm greenhouse a couple of different ways. You can just buy 2 pieces of the film and attach them together. Or, the easiest way to do this is to buy a tube of the polyfilm. This is just a double layer that is already fastened together. The base and wire system is set up to hold up to 6 layers, so this is not an issue. You will also need a poly inflation fan kit to inflate the 2 layers. I have had some people mention that they think this makes the cover tighter and less susceptible to tears. I have no proof of this, but it does seem a logical conclusion. The R value of double polyfilm is 1.7. This will save you 40% on the energy costs over a single layer of polyfilm. The installation on this is done in the same manner as a single layer of polyfilm. This film will basically be twice the cost of the single polyfilm, as you are basically just using a double layer of the same material. You will have the additional cost of the blower fan. 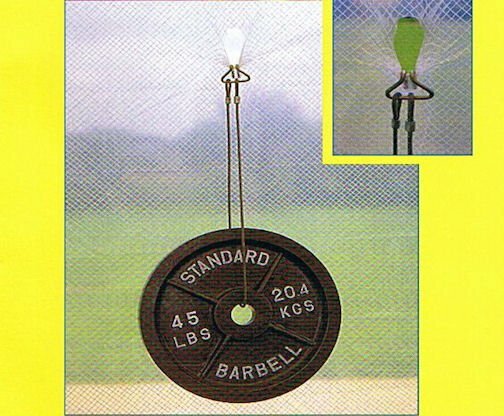 These are typically around $200 or less, depending on the size of the greenhouse and the size of the motor needed. This film may last a little bit longer than the single layer. As I stated earlier some claim that they inflation keeps the film from tearing as easily. The UV protection is rated for the same amount of time as the single polyfilm. Polycarbonate is the greenhouse covering of my choice. It fits my needs the best of all of the materials. However, a lot of people don’t like it because of its appearance. It is a rigid plastic configured in much the same way as a piece of a cardboard box. It has a sheet on the outside, a sheet on the inside and a rib that runs through between the 2 sheets. The rib in polycarbonate will be straight vs the wavy rib in a cardboard box. This will distort your view. You will be able to see color, but you will not see form clearly. I use the example that you can see a green leaf and a red flower, but you will not be able to make out if it is a poinsettia, geranium, impatiens, etc. Of course the clear polyfilm is not exactly clear either. It will have a hazy type of appearance to it. If you want a clear glass like view, tempered glass is your only option. Polycarbonate sheets are available in several different thicknesses. 8mm clear twinwall will have an R value of 1.8. 16mm clear triplewall will have an R value of 2.4. This will be the most efficient of the coverings we are discussing. 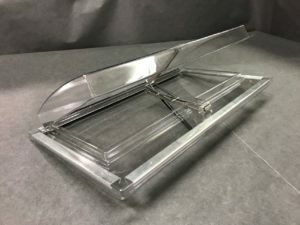 Installation of this material requires polycarbonate H profiles to join the sheets side by side and polycarbonate U channels to close off the ends. 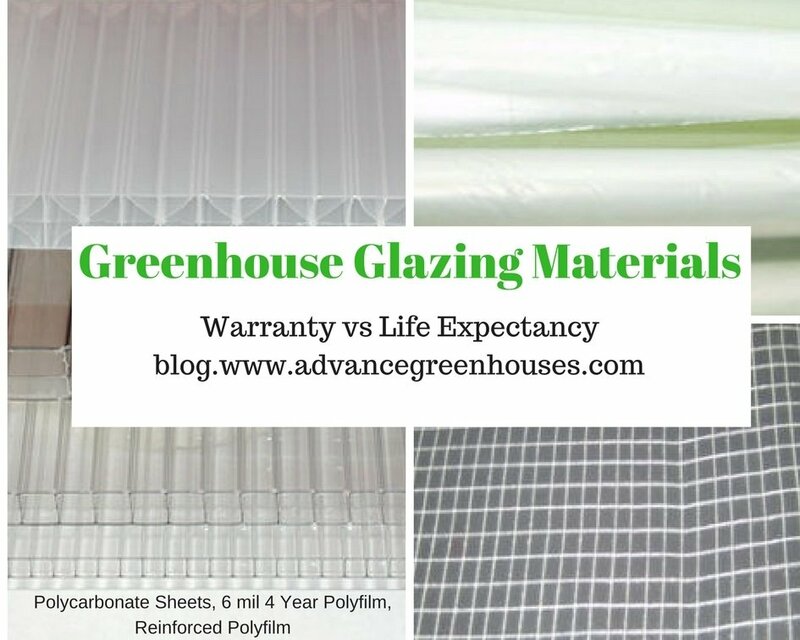 You will need more framing for this material vs polyfilm greenhouses. 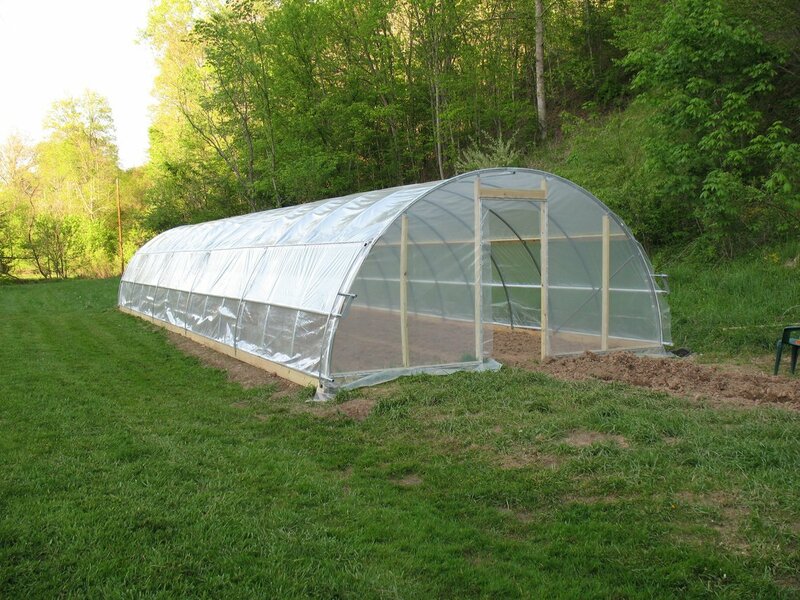 Typically polyfilm greenhouses will have 4′ or 6′ wide spaced bays. You can do the same with the polycarbonate, but you will need to run purlins between the rafters spaced according to your snow load needs. There are charts available to determine this. You can typically install this with 2 people as the sheets are not heavy and you install one 4′ wide or 6′ wide sheet at a time. You still do not want to try to install under windy conditions as the sheets can be caught by the wind and sail away. This will be the most expensive of the coverings discussed in this article. But, it will be the longest lasting. Depending on the manufacturer polycarbonate sheets have between a 10 year and 20 year warranty on the UV. Most sheets also have a 10 year warranty on hail damage, so no need to worry about tears. The practical life expectancy of this material is 20 – 25 years. When considering which of these materials to use to cover your greenhouse you should look at the initial cost, the cost to install, the cost to heat the greenhouse, and the life expectancy of the material. Once you have made these decisions you should be able to choose the best covering for your greenhouse with ease. 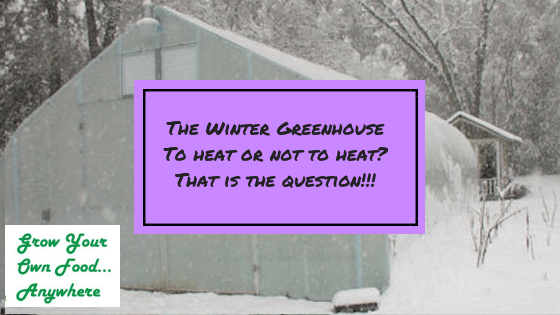 The Winter Greenhouse – To Heat or Not to Heat? The winter greenhouse – to heat or not to heat? That is the question!!! We all want to use our greenhouses in the winter. But, it can be costly to heat them all winter long. For certain crops you will need the heat. Do you want to grow seasonal winter crops without the cost of additional heating? Or, do you want to pay the heat bill to have tomatoes and peppers all winter long? That is the real question. Did you know that a greenhouse will build up a lot of heat during the day? That is why you need a ventilation system in place. But, once the sun goes down the heat will begin to dissipate and disappear. In order to keep your greenhouse above the outside temperature at night you will need to have heating systems or other solar systems in place. You can keep some heat in your greenhouse at night by using a few solar practices. You can pull a solar blanket over the roof of the greenhouse to help keep any heat inside. These are on the inside of your greenhouse and are typically a heavy blanket that can be pulled at night. Probably the most popular and easiest method is to use black containers filled with water. These will build up heat during the day and let off the built up heat slowly through the night. You can use gallon water jugs painted black or 55 gallon drums. You can put a compost pile in your greenhouse. Although, I have heard quite a few people complain about the smell. If you have a properly balanced and properly functioning compost pile you should not have these odors. But, if you want to spend some time and money you can put your compost pile outside and pipe water through the pile (which will heat the water in the pipes) and through the greenhouse for heat. Some people will use a layer of bubble wrap (yep, like what is used for packing in all the boxes you receive) to help add insulation to their greenhouse. They basically just line the interior with the bubble wrap to help keep the greenhouse a little bit warmer. These methods will all give you supplemental heat, but none of them will give you a way to control what end temperature you require. To set the heat at let’s say 60 degrees, you will need a heater with a thermostat. are available in electric, natural gas and propane. I much prefer the natural gas or propane. My top pick, and the heater that I use in all of my personal greenhouses, is the Southern Burner heater. I have used both the natural gas and the propane models. I find that they both function the same. These are great heaters because they require no electricity. They are the perfect size to fit under a greenhouse bench, thus staying out of the way and not using up valuable space. There is a vented and a non vented model. I personally have always used the non vented heater, but there are some locations in the US where this is a problem and against code. Even though it is called a non vented heater you still need to have a fresh air supply. A relatively inexpensive, but very valuable tool is a max/min thermometer. These can go from low tech models to models where you can monitor the temperatures from inside your home. Some even have an alarm system set up with them if the temperature drops too low. These are valuable in both a heated and unheated greenhouse to help you troubleshoot any potential problems that you may have. You can grow just about anything that you can grow in your garden in the summer if you heat the greenhouse. Your night time temperature for tomatoes must be a minimum of 55 degrees. You can also grow peppers, squash, cucumbers, melons, beans, eggplant, corn, basil, tomatillos, etc. If you are growing in an unheated winter greenhouse there are a few rules you should follow for the best harvest. You must be growing crops that are in season during the winter in your area. These cool weather crops include crops such as lettuce, spinach, chard, carrots, etc. Do NOT try to grow warm weather crops in an unheated winter greenhouse. If you are not sure of your growing seasons I would check with my local extension office to see if they have a free vegetable planting guide available. If you don’t know where they are just do a search for extension office “my town”. Do not try to grow in containers. They will lose any heat they have retained rapidly. You should grow in the ground or in raised beds. Cut back on how much water you think the plants will need. Plants require a whole lot less water in the winter than they do in the summer. Only water when the ground is dry 1″ to 2″ below the surface. to the cold frames or under the mini hoop house. I always like to use heat cables in my personal cold frames. I find that it gives a higher yield earlier. Just be sure that you check these in the morning. Depending on your location and your weather your cold frame or mini hoop house made need to be opened during the day and closed at night. You can typically grow lettuce, spinach, radishes, carrots, beets, turnips, kohlrabi, broccoli, cabbage, bok choi, chard, greens, mustard greens, kale, chives, chinese cabbage, english peas, and cilantro (may require a double layer growing system such as the cold frame). To heat or not to heat? Well, that is really your decision and should be based on how much money you want to spend for winter heat and what crops you want to grow. Whichever way you go, fresh veggies year round can’t be beat! Enjoy! 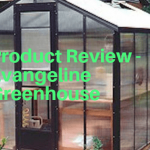 Today we are going to do a product review of one of the greenhouse kits that we offer. 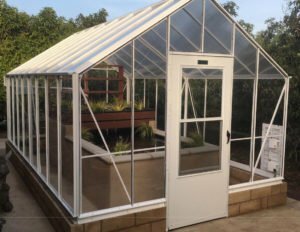 The America’s Best Polycarbonate Greenhouse and the Best Buy Lean to Greenhouse are basically the same structure, just one is freestanding and the other attaches to your home or a building. These both offer what we feel is the best “bang for your buck” in a greenhouse Made in the USA. They offer quality materials and excellent pricing. The frames are made of 6063-T3 aluminum with a powder coated finish. This high grade aluminum gives the frame strength and durability. The standard colors are white, brown or green, but fear not, we can custom match the color of your home, your favorite sports team, just your favorite color. The stated wind and snow loading are 70 MPH winds and 23 pounds per square foot snow load. All framing is assembled using stainless steel T bolt and stainless steel lock nuts. This frame also has a 10 year warranty against damage due to faulty materials. The greenhouse is glazed with 6mm clear twinwall polycarbonate. 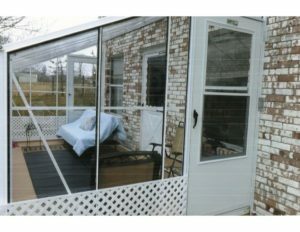 The polycarbonate sheets have a 10 year warranty that they will not vary more than 6% in light transmission in 10 years. This is a fancy way of saying that this material will not yellow, get brittle or break. Actually, I have personally seen this same material in use past 15 years. I have heard reports back from people in the industry who have seen this material in good usable condition up to a period of 20 years. There is also a 10 year warranty against hail damage. Some people do not like the twinwall polycarbonate because of the view through it. The twinwall is like looking down the end of a cardboard box. It will have a clear sheet on the inside, a clear sheet on the outside, and a rib that runs through the center of the 2 sheets. In a cardboard box the rib is wavy. In a polycarbonate sheet the ribs runs straight between the 2 outer sheets. This is what will distort your view. You will see color, but not form like looking through a glass window. But fear not, there is an upgrade available to both of these greenhouses. We call these options the See Through Polycarbonate Greenhouse and the See Through Lean To Polycarbonate Greenhouse. These both come with the twinwall in the roof, for protection against hail and/or falling objects. The sidewalls have a clear view polycarbonate sheet that is exactly like looking out through a window. The best of both worlds. 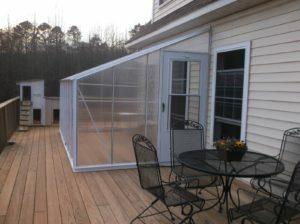 Another great feature is that the ventilation package is included in the pricing of this greenhouse. It includes the thermostat, exhaust fan and intake shutter(s) in the freestanding models. 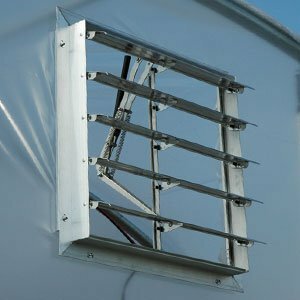 The lean to greenhouses do not have the intake shutters. Your combination storm door will supply added ventilation and supply the air intake for the lean to models. This “free” feature definitely adds to the value of the greenhouse. These systems cost in excess of $500 typically. Also included in the upgraded model is a circulating fan. This is an often overlooked, much needed, option. These will aid in the health of your plants by keeping the air in your greenhouse moving and reducing the humidity in the plant canopy. They help to maintain an even temperature in the winter when the greenhouse is heated, helping to avoid hot or cool spots in corners. We offer the homeowner the choice of the optional roof vents. I personally prefer to have these, as I feel you get a lot of use out of them in the spring and fall seasons. They typically stay closed in winter and open in the summer, so the added benefit there would be natural ventilation in the summer months. The reason I like them in the “between” seasons is that you run the possibility of a cold night and a hot sunny day. You would want your vents open during the day and closed at night under these circumstances. That is why I always use automatic roof vent openers with my greenhouses. The integral base is built into the greenhouse, so no need to build an additional base for the greenhouse. We do however recommend setting the greenhouse on a foundation of 4″ x 6″ timbers set down into the ground. We tie the timbers to the ground using rebar stakes. This will help keep your greenhouse secure in higher winds. Do you prefer to build a knee wall to place your greenhouse on? This is not a problem. We also offer an optional door drop to accommodate this. We just need to know the height of your kneewall in inches and we will adjust the frame while building it so that the door will fit to the ground. This greenhouse is shipped by Common Carrier (truck line). It will come in 3 – 4 boxes depending on accessories and size of the greenhouse. Two people should be present to unload this greenhouse. These typically take about 4 weeks from the time they are ordered until the time you receive them. Your greenhouse is built specifically for you. There is no need to accept a “boxed” greenhouse with no options. 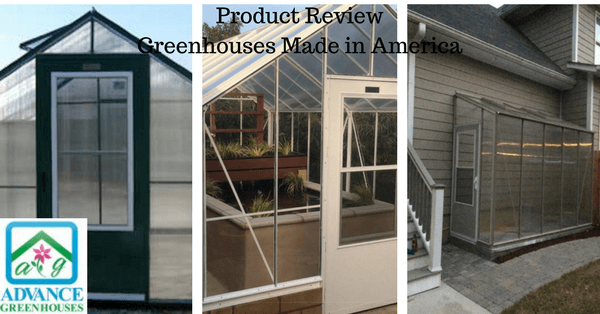 In closing, with all of the quality features, excellent pricing and the fact that this greenhouse is Made in the USA, we give it 2 (green) thumbs up. What are the benefits of polycarbonate multiwall panels? Are you building a homemade polyfim greenhouse, but are unsure about how to ventilate it? Here are a couple of solutions for you. You can see that this greenhouse has roll up sides, an option which is readily available, but can be costly. We have 2 options available that insert directly into your polyfilm covering without any additional framing. They use the channel base and wiggle wire to insert directly into the greenhouse covering. You simply cut the film and install these accessories directly into the film covering without any additional framing. The first option is a solar powered greenhouse shutter. This has louvers and a wax cylinder powered opener. It will open when it is warm and close when it is cool automatically. They are available in 6 different sizes. If you would like to use this on another type of greenhouse such as polycarbonate, we can remove the base channel and you can insert this directly into a wood framed opening. The second way to do this is with a solar powered roof vent. This is a lightweight polycarbonate vent. 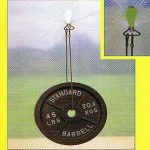 It weighs less than 10 pounds, but you get all of the benefits of the durable polycarbonate covering. It also has the was cylinder powered opener that will automatically open and shut the vent as the temperature requires. To install this you simply cut the polyfilm and install it directly into the greenhouse covering. A lot of people prefer to build their own greenhouses rather than purchase a kit. 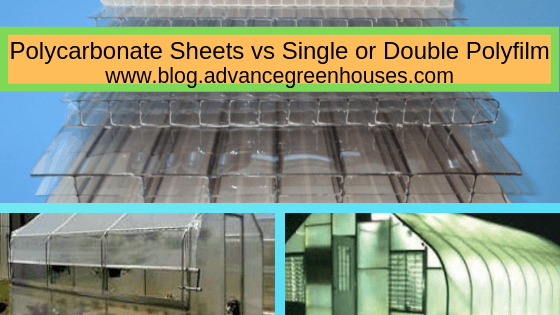 With these 2 ventilation options, there is no reason not to build your own polyfilm greenhouse.